Forget about the usual boring lights that only give off an unattractive white light. These submersible party lights offer you a variety of colors and flashing modes that you can change with the remote control. Choose the color that suits your theme and impress all of your guests with this truly unique decoration! Being submersible and waterproof allows you to place them in water for decorating flower arrangements, pools and water fountains, and thus perfect for lighting up vases, bowls, or any containers are filled water. Amagic submersible led lights have a little sheet of paper between the light and the batteries so they don't waste the battery life. Unscrew the top, remove the cardboard disk over the battery and replace the top. When you tighten it up, the light comes on. ★ NOTE:If you forget to put the film back or take the batteries out after several days,some(all) lights never wake up (battery will still slowly consumed and power out). That is why some customers complains about the batteries. Therefore, after you test/use these lights, you should take out the battery or put on protective equipment (a small white flakes). 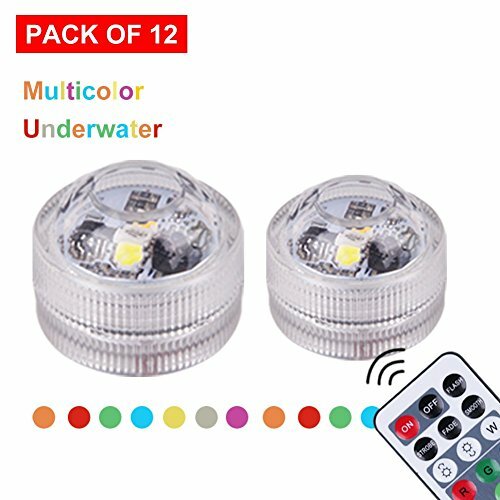 【WHAT YOU GET】 12 * small submersible led lights- Powered by 2x CR2032 battery(INCLUDED); 2* 21-keys IR remotes; Spend less to get 2 more submersible tea lights and 1 more remote control. 【GREAT WATER RESISTANCE】 Exquisite tiny rubber gasket makes the submersible led lights waterproof. Nicer than older version in the market, our mini led submersible lights surface is seamless. Any water drop or water flushing be resisted. These have been tested in large bodies of water and will remain lit even when submerged for a long period of time. 【WITH 2 REMOTE CONTROLS】 Powered by 2xCR2032 battery(included), the underwater led submersible light provides 13 different colors, such as warm white, red, green, blue, white, yellow, purple and other colors. 3 light modes includes fading/strobe or smooth mode. Bring you pleasant visual experience with more options. 【LONG LASTING】 No need to worry about running out of batteries in the middle of your party! The color changing submersible led lights can last for 10-12 hours at a time so you can rest assured that the lights will shine bright all night long! The underwater submersible led lights are very durable and reusable, just replace the CR2 batteries when it's time, and you're good to go! If you have any questions about this product by AMAGIC, contact us by completing and submitting the form below. If you are looking for a specif part number, please include it with your message.